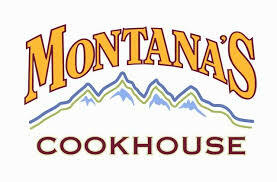 Montana's is known for their ribs, steaks, rotisserie chicken and other lodge fare. The restaurant aims to be a family/casual concept, rather than fine dining. The theme of the restaurant is of a lodge/wilderness setting and they try to provide guests with an escape to simpler times. Montana's has been promoted in TV ads consisting of a mounted buck and moose hunting trophies conversing about the restaurant.